Thousands and thousands of people are protesting in Bangkok, the capital of Thailand. Protesters have surrounded government offices, and some have had to shut down. 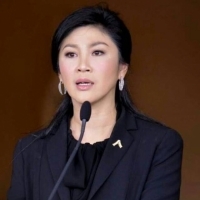 They want the country’s leader, Prime Minister Yingluck Shinawatra, to step down. Earlier this month, the government tried to pass a bill which would forgive people who had been involved in wrongdoings during political protests in the past. The bill did not pass, but it made many people furious. The protesters are peaceful and are armed with whistles and hand-clappers, which make a lot of sound. Yingluck was elected as the prime minister in 2011. She is the sister of Thaksin Shinawatra, who was Thailand’s prime minister from 2001 to 2006. Many people thought Thaksin was corrupt, and he was forced to step down by Thailand’s military in 2006. There are charges against Thaksin, and he has been living outside of Thailand since 2008 to avoid going to jail. This bill that people were opposing could have forgiven Thaksin as well. That’s one of the reasons people got upset at Yingluck. Thailand’s head of state is King Bhumibol Adulyadej, one of the world’s longest-serving current monarchs (over 67 years). He is loved and respected by the Thai people. Thailand is famous for its food, floating markets, and temples. Thai food tries to balance all five fundamental tastes – sweet, spicy, sour, bitter, and salty – in every meal. 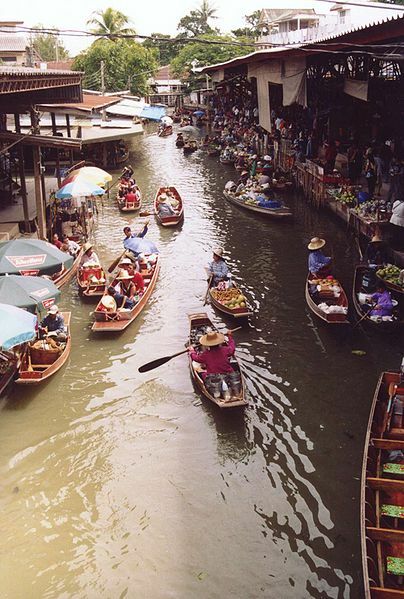 Damnoen Saduak is one of the country’s famous floating markets. People come in their canoes selling vegetables, fruits, snacks, hats, flowers, and lots more. About 90% of the Thai people follow the religion of Buddhism. 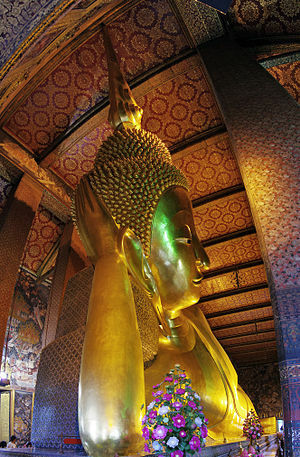 A famous Buddhist temple in Bangkok is the Wat Pho Monastery. The temple has a statue of Buddha in a reclining position. The statue is about 45 meters (150 feet) long and 15 meters (50 feet) high. The term “white elephant” (which means something that is expensive but not very useful) has origins in Thailand. In ancient times, white (albino) elephants were regarded as sacred and could not be put to work, but had to be fed and taken care of. Therefore, owning a white elephant was expensive and not very useful. Yingluck Shinawatra is Thailand’s first female Prime Minister. Bangkok’s full Thai name is rather long: Krung Thep Mahanakhon Amon Rattanakosin Mahinthara Yuthaya Mahadilok Phop Noppharat Ratchathani Burirom Udomratchaniwet Mahasathan Amon Phiman Awatan Sathit Sakkathattiya Witsanukam Prasit. It translates as “City of Angels, Great City of Immortals, Magnificent City of the Nine Gems, Seat of the King, City of Royal Palaces, Home of the Gods Incarnate, Erected by Visvakarman at Indra’s Behest”. Phew!